Let’s talk about virtual tip jars. As you know, Ahalogy makes it our mission to help our partners succeed in their businesses and give them the tools to thrive. So, when we got wind of a local start-up, Juble It!, a virtual tip jar for online creators, we wanted to take the time to share it with you all. Juble It! is a virtual tip jar for online creators that can be added to any site, giving readers an opportunity to “tip” you within seconds. The “tip jar” comes in two forms; 1) a short URL that can be placed in any post, comment, or profile on any social platform or 2) a social button that can be installed on your website. Clicking on either allows your audience to say thank you for the amazing content and advice you share on the daily that they are applying to their life. Blogs, similar to magazines, share ideas that help bring joy and value to the lives of those who read, absorb, and apply that which they’ve read. However, magazines require a subscription. Because online creators are sharing magazine-quality content without the subscription, tools like Juble It! give audiences the opportunity to give back when your content has moved them or helped them in some way—whether it’s a meal plan they’ve followed or parenting advice they found useful. It’s free and gives you another outlet to make some income doing what you do best. 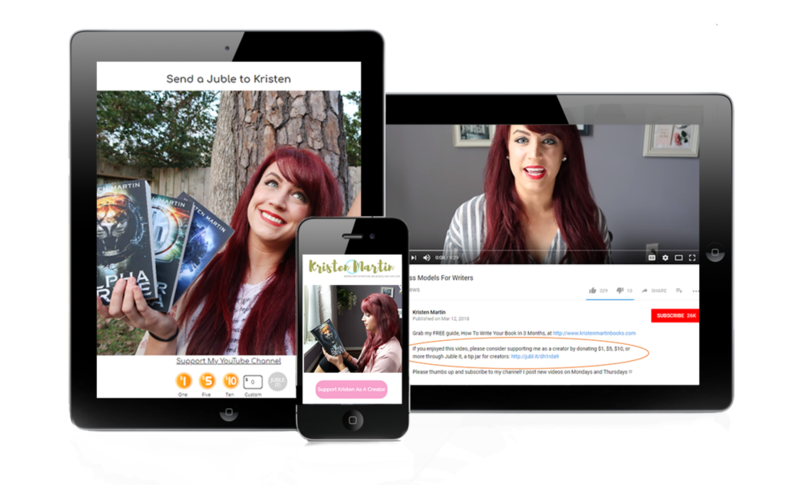 When your readers use Juble It!, they can give you $1, $5, $10, or a custom amount. This isn’t like the PayPal Donate button that takes up to a minute to complete. When your readers Juble it!, they can create an account and give as little as $1 in just three seconds. Known for their ability to reduce friction, the Juble it! Platform doesn’t require your readers to share payment information until a later date when they have more time and it’s more convenient. All payments are made securely and safely through the long-time trusted Paypal system and Juble It! will take a modest and transparent percentage of 10% (includes payment fees) every time a fan Juble's your content. No longer do you have to go to another platform (like Patreon or Kickstarter) to get monetary support from your fans. With Juble it!, you can get that support directly from where your readers know you best; your social platform or website. This is a big benefit for both sides as Juble it!’s simplicity helps empower goodwill and appreciation. Another added perk? Your Juble It! button can be customized to the look and feel of your website—for a seamless design that is cohesive with your brand equity. How and when would I get paid? At the end of every month, all your Juble It! tips will go directly into your Paypal account. For Installation on Social Platforms (YouTube, Instagram, Facebook, etc. ), just place the link in any post, comment, or bio. For installation on a website, create a button with your CMS (Wordpress, Squarespace, etc.) and then make it clickable by putting the Juble Link behind it. You can sign up here or visit their website for more information. We love seeing new ways surface for online creators to be recognized for the hard work and good ideas they share. Like Ahalogy, Juble It! is a startup always looking for feedback to help them improve and refine so if you decide to try out Juble It! please tell us what you think.